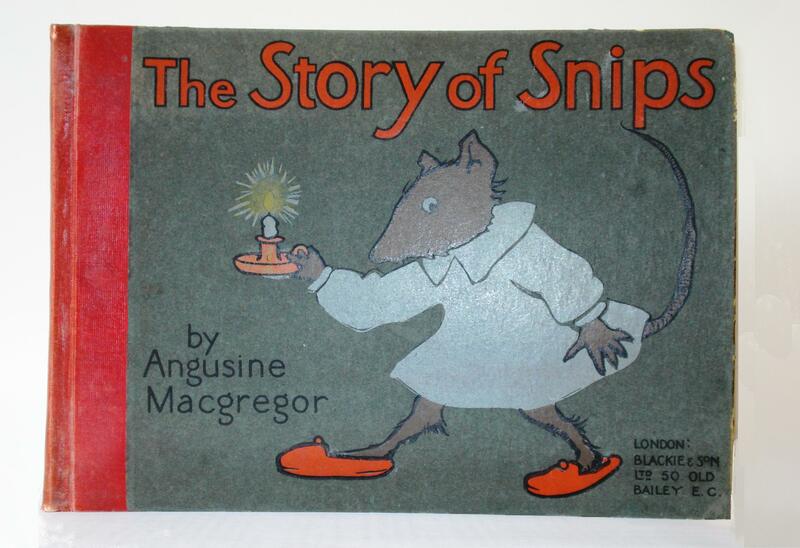 The Story of Snips by Angusine Macgregor is my oldest picture book, copyright circa 1909. I always felt it had a rather homemade look and I was therefore very surprised to discover a different version is owned by Barbara of March House Books. I promised her I’d share pictures of my copy as well, so here it is. The 48 page book is 9 1/2″ wide by 7″ high with 23 full page illustrations. Hard back binding is publisher’s original illustrated grey paper covered boards with a red cloth spine. Snips was a very naughty mouse, so his parents packed him off to boarding school. When he did not know his lessons, he was made dunce by the strict schoolmasters. 😦 BUT, to give away the happy ending, he escapes and eventually becomes a model mouse! Thanks so much for sharing the pictures. Would it be OK for me to put a link from my post to this one? I would think your copy is probably earlier than the one I have because mine was published in the ‘tiny tots’ series. Barbara. Sure, a link is fine. It’s been fun to compare the two versions. What an adorable picture book! It’s a beauty, Marcia. I miss the simplicity of color and line that most older PB had. back then it had to do with printing limitations, but now the sparseness looks so elegant. I like how you describe the beauty of old illustrations. Thank you, Mirka. What a beautiful little book!! I too am drawn to the simple lines and the color of the illustrations!! What a treasure you have!! Thank you for posting this!!!! Me, too. Thanks for your comment! This looks like such a sweet book, Marcia! I love old books! Yes, Snips is a sweetie. Thanks for stopping by, Becky! The overall glance of your website is fantastic, let alone the content!